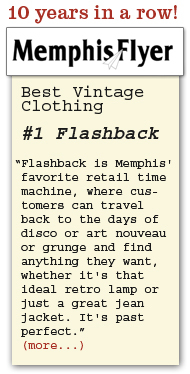 lashback, The Vintage Department Store, offers Memphis an opportunity to shop the decades of the 20th century. Elvis impersonators and regular fans visiting Graceland, Sun Studio aficionados, and Stax Records followers, enjoy seeing items that define the scene of the time. 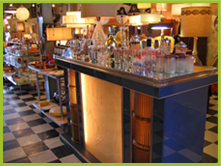 Customers can find vintage items from the 1920’s, 30’s, 40’s, 50’s, 60’s, 70’s, and 80’s. Art Deco to Art Modern, funky fifties to Danish modern, and many of the trends of the 1900’s can be discovered at Flashback. 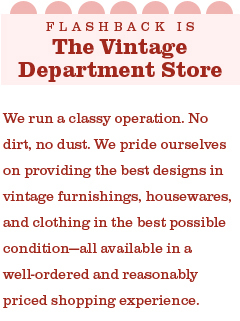 As THE Memphis vintage clothing source, period garments and accessories are available for costumes or every day. From elegant or funky hats and sunglasses down to cool shoes and funky boots, Flashback has it all covered. While shopping the antique district of historic Midtown Memphis, prowl our 2800 square feet of gift ideas and personal treasures. The items presented are sure to amuse and intrigue individuals of all ages. New retro designs complement the vintage inventory. Supplying Memphis with retro fifties diner booths, chrome dinettes, barstools, and tables, Flashback provides quality home furnishings.